“The first fold of our flag is a symbol of life. The eighth fold is a tribute to the one who entered in to the valley of the shadow of death, that we might see the light of day, and to honor mother, for whom it flies on mother’s day. In 1953, when my then-three-year-old sister died of leukemia, my mother and father buried her at Arlington National Cemetery, promising to join her after the two of them had seen their lives through. Sixty years later, my family and I have now fulfilled that wish. I don’t know quite how to explain the power of the past two days. It’s 1:15 in the morning, here in the nation’s capital, but I can’t sleep. Not yet. Not without telling a little bit of this story. On Thursday, we gathered in the family greeting area in the Administration building at Arlington and were met by two representatives of the Marines, part of my parents’ honor burial. “Your father was a national treasure,” Colonel Steve Neary told us. He went on to recognize not only my father’s service, but my mother’s sacrifice as well. Arlington’s representative, Mr. Dixon, led us to the transfer point where a company of Marines, a contingent from the USMC Band, and a caisson awaited, drawn by six horses. Two Marines moved toward the cemetery vehicle in such slow motion that time felt suspended. Fluid step by fluid step, they approached the drawer in the flag-draped coffin, and gently placed the urn inside. Because we created a companion urn for them, Mom joined Dad on the stately march to to grave site. Drums led the way, followed by a company of Marines in lock step. Then the caisson, and then those family members who chose to follow the caisson on foot. 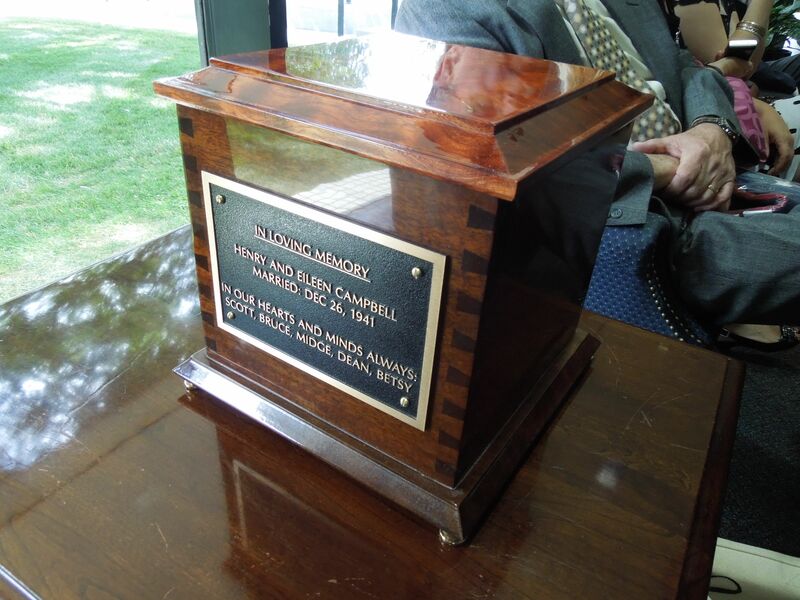 We sat within view of Midge’s grave stone while the urn was placed on the pedestal. To our left, Col. Cabaniss, Commanding Officer of Marine Barracks, commanded the Marines. 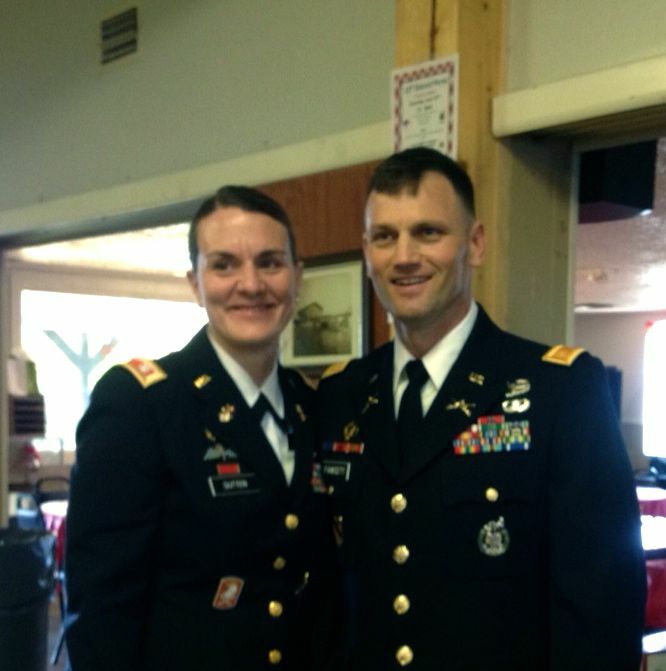 The Chaplain’s remarks reflected his understanding of my parents’ story. He spoke of Dad’s valor in Saipan, Tinian, and Iwo Jima. 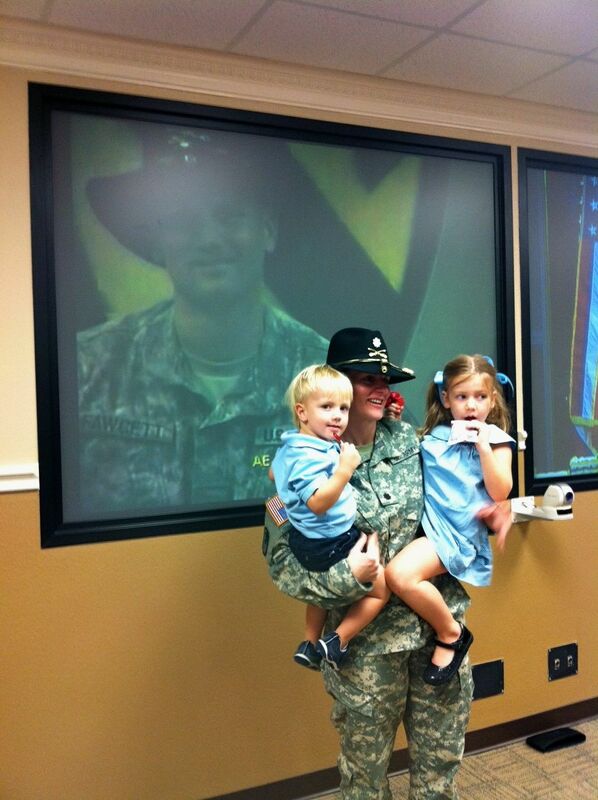 He acknowledged Mom’s sacrifices, and the value of their service to their country. In his prayers, he spoke of them being joined with Midge for eternity. Seven rifles fired three shots each, a 21 gun salute. Taps played. I lost it. Agonizingly slowly in the glaring mid-day sun, the Marines folded the flag, and presented it to my brother, who passed it to me. I held the perfectly folded triangle against my stomach, like a child. One by one, the officers dropped a knee and extended their condolences to we four siblings, we adult children who carried through the wishes of our parents. That night, the family gathered at Siroc Restaurant on McPherson Square. 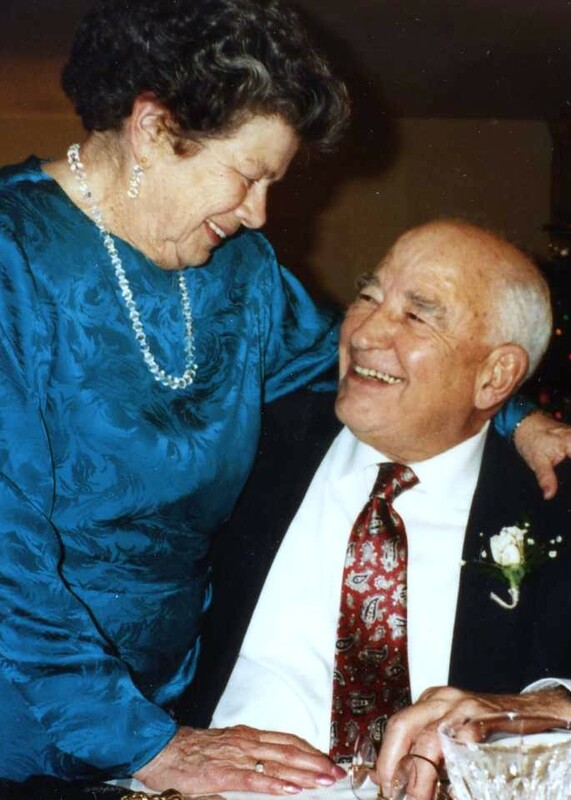 Food, family and wine: all the ingredients we needed to honor my parents’ legacy. If yesterday was the fulfillment of a wish, then tonight was the fulfillment of a dream – a chance to viscerally demonstrate my parent’s legacy of love and service by attending the Marine Baracks’ evening parade as guests of its executive officer, LtC. Tom Garnett. Two hours of riveting ritual, unfolding at a stately pace, performed perfectly under the watch of Major Sarah Armstrong, Parade Commander, and directed by Sgt. Major Angie Maness. Dad and Mom, I’m sure, were smiling, to see two such accomplished women in these roles. The graciousness of the Barracks, in inviting us – all of us – to attend the parade as their guests, moves me beyond words. And if that weren’t enough, we happened to attend the annual parade hosted by the Commandant and honoring the chiefs of all of the armed forces, and were introduced by Col. Cabaniss to the Commandant, Gen. James Amos. Though I would do anything to change the reality of losing Mom and Dad, I know that celebrating their lives has brought us together. Some branches of the family had never met before this week. We experienced something rare, together. A dream fulfilled. Like many men of the Greatest Generation, Dad was always quick to deflect attention from his accomplishments during the war. The real heroes, he said, were the guys who were wounded or died. As a child, I morbidly wondered if he ever killed someone. So far removed was it from my experience that I thought of it like something from a movie. I never found out if he did, never asked him, perhaps because when the topic of the war arose, there was always a pause. For a moment he seemed far away, remembering scenes, perhaps. Or people. Only in the last 15 years of his life did he share information about his role during the war. Even when sharing relatively lighthearted stories, he would often be moved to tears as memories welled up. After instructing recruits at the base in Quantico for two years on rifle marksmanship, bayonet training, mortars, map reading, nomenclature, and cleaning of all the military weapons, he received orders to join the 23rd Marines, 4th Marine Division in 1943. He was to serve as R-4, Regimental Supply Officer. When I was young, I didn’t think being a supply officer sounded very exciting. But Dad would put it in context for me, explaining, “Your intelligence officer tells you what the enemy can do, while your supply officer tells you what you can do.” The supply officer’s job is to ensure combat readiness by having the personnel and materials in the right place at the right time to achieve the combat objective. The lack of food and supplies confounded Gen. Robert E. Lee on his northernmost advance to Gettysburg, and we know how that ended. Had the Confederate Army had adequate supplies, things might have turned out very differently. “I was told to take a communications group and establish an advance command post with about 15 guys. Rhett Williamson was S4 Supply and Logistics Officer. …He had stuff coming from five places. The first time I know about it is a truck shows up at the gate for instructions. We start getting these loads of stuff. Loading should have been pre-planned. Rhett isn’t down on the docks. It’s chaos unless I do something about it. This went on for 10 days. When we got through, we were the only ones in the U.S. who knew what we had and where it was. Louis Jones, Regimental Commander, asked Rhett what was going on and kept him standing there until 4 a.m. Then he said, “Campbell, you are now R4 (Regimental Supply Officer). “We got it all on there. At 2 a.m., I got a call at the gate. ‘We have a load of explosives on there.’ The Commanding Officer said he didn’t want any explosives on the base without him knowing about it. So I called him at 2 a.m. I never heard from him again. “At 6 p.m., we’re all loaded up. We were supposed to leave at 8 a.m. At 7 p.m., a truck shows up with ammunition. I asked him what was in the trucks. He said enough for a round of fire for an entire regiment. So I told them to unload the ship, put everything on the dock, and put the ammunition in the boat. 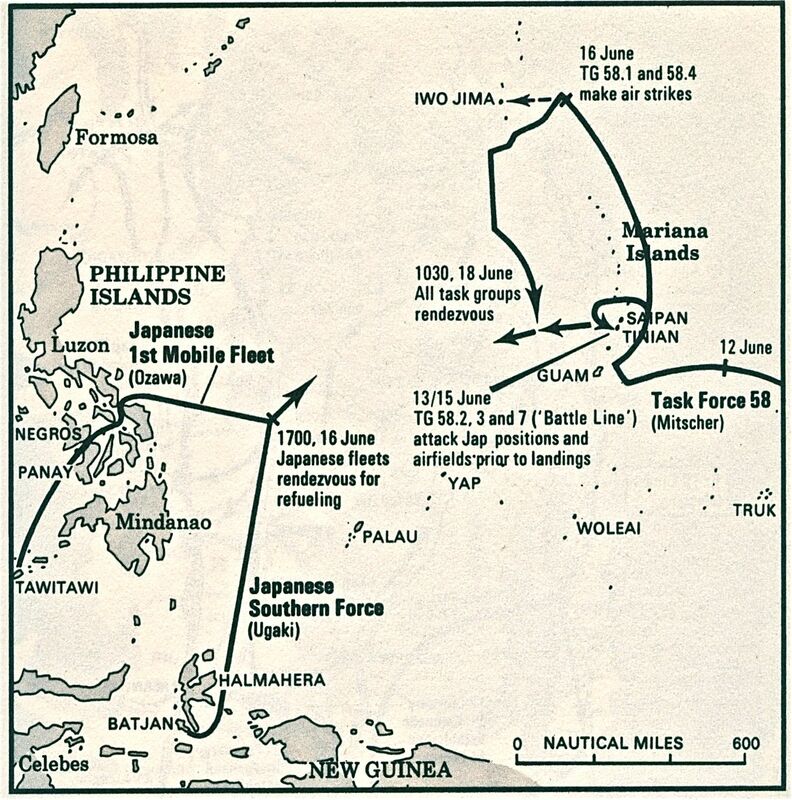 According to John Costello writing in The Pacific War 1941-1945, the 4th was to participate in Operation Flintlock, the plan to assault Japanese positions in the Marshall Islands that were being used as bases for ships, submarines and air staging. The battle plan was hotly debated because of the bloody lesson of Tarawa, which had resulted in heavy losses. The plan called for attacking two positions in the Kwajalein atoll. Roi-Namur, the northern objective, was made up of two islands connected by a narrow causeway. In alignment with battle tactics learned the hard way based on the first two years of the war in the Pacific, the islands were blasted by battleships for three days before the amphibious landing. Now S-4, Dad’s job was to get materials ashore. He secured a boat driver and chose to land supplies after the first wave of infantrymen but ahead of the next wave. 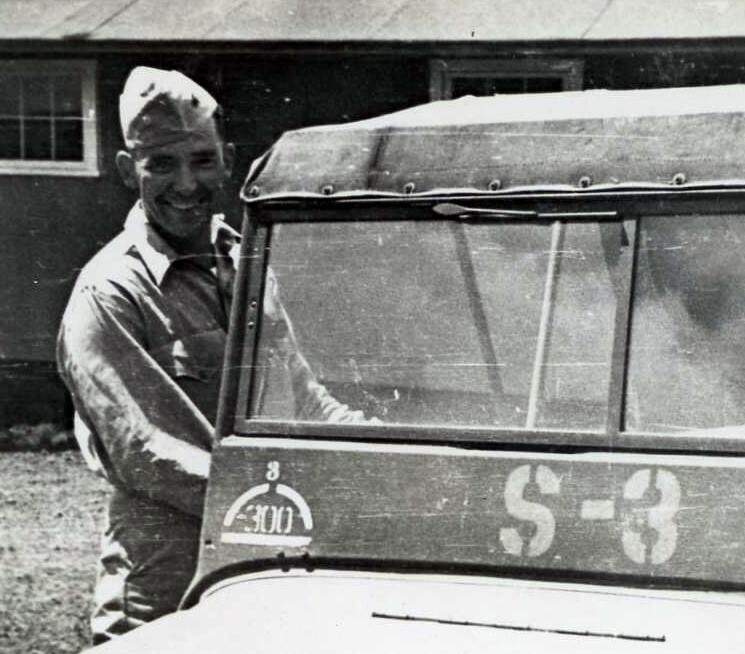 Company Commander Shelton Scales’ jaw was said to have dropped when he landed on the beach and found Dad there ahead of him. The attack that began on Jan. 31, 1944 was mopped up by Feb. 3. Saipan was a challenge of a different order. The Battle of Saipan was part of “Operation Forager,” which aimed to sieze Saipan, nearby Tinian and recapture Guam in the Marianas. According to Costello, “Operation Forager’s 535 ships and the 127,571 troops assigned to the American assault in the Marianas made it not only the largest force yet assembled for any naval operation but also the instrument of a new phase of the war.” Now American troops would attack well-defended bases of Japan’s inner defense line rather than pulverize atolls. Bombardment began June 13, 1944, and D-Day was two days later. With over 3,000 killed and 10,000 wounded, it would become the costliest operation for American forces to date – but that cost paled in comparison to Japanese loss of life. Five thousand Imperial Army soldiers died in suicidal Banzaii attacks, and an estimated 22,000 civilians died, principally because their shelters were in harm’s way and indistinguishable to Marines who cleared suspected bunkers with explosives. Even more horrifying, an estimated 1,000 women and children jumped off a cliff to their deaths based on orders from Emperor Hirohito suggesting they would be heroes on a par with soldiers in the afterlife if they did not surrender. Taking Saipan took six weeks. As costly as Saipan was, it brought Tokyo within range of B-29 bombers. “Tinian was heavily defended. Although there were good landing areas on the south side of the island, at the Corps level, they decided against landing there and instead chose a small landing beach about 100 yards wide. They figured they could get people on the beach and it wouldn’t be defended. “D-Day was 7 a.m. Scads of landing craft were offshore. My regiment was in reserve for landing since they were part of the assault on Saipan. They were supposed to move in behind the initial troops. The initial landing proceeded okay. The 2nd regiment was supposed to land – to come through us and proceed. We were supposed to wait until after they were off of the causeway. “I borrowed a jeep and talked to Col. Jones. He said, ‘Campbell, I want all communication vehicles and anti-tank guns ashore.’ I took a boat to talk to the control officer, Col. ‘Jack’ Horner. Col. Horner said, ‘Campbell, I’ll get to you as soon as I can. I have to land the 2nd regiment ashore.’ I told him, ‘Col., we’re astride.’ He said, ‘Campbell, I told you I’d let you know—now goddam it, get off my boat.’ I looked for a hole and put my men ashore. When I told Col. Horner later, he threatened court martial. “The main attack came in that night. Regimental guns killed 600 Japanese that night with 36 mm anti-tank weapons that shot canisters of grape shot. It didn’t last long. Our counter-attack broke their back at the end of August. “We found beer in a Japanese dugout. Every man in the regiment got a bottle of beer and the rest went to Division. “Saipan is where the Japanese jumped off a cliff rather than be captured. They believed they would be tortured by the U.S. The remaining pockets of resistance ranging from squad- to platoon-sized raised hell – it was really dangerous. Our battalions were spread out on the North end. At night we formed a defensive perimeter. 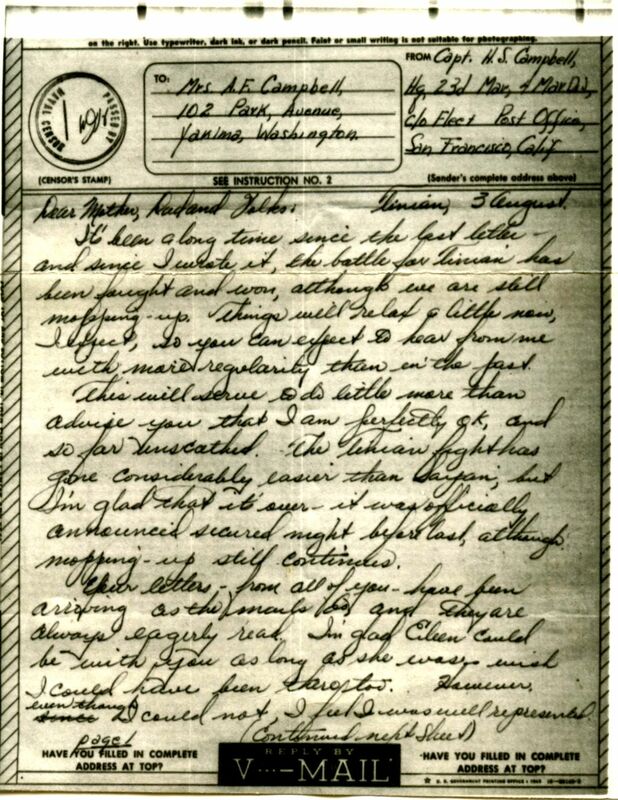 It’s been a long time since the last letter, and since I wrote it, the battle for Tinian has been fought and won, although we are still mopping up. Things will relax a little now, I xpect, so you can expect to hear from me with more regularity than in the past. This will serve to do little more than advise you that I am perfectly OK, and so far unscathed. The Tinian fight has gone considerably easier than Saipan, but I’m glad that it’s over – it was officially announced secured night before last, although mopping up still continues. You letters – from all of you – have been arriving as the mails do, and they are always eagerly read. I’m glad Eileen could be with you as long as she wash – wish I could have been there too. However, even though I could not, I feel I was well represented. It must have been a lot of fun, and from your letters and Eileen’s, everybody had a pleasant time of it. As for myself, I am – as I said OK, and am at the moment enjoying a little relaxation. That won’t last, of course, — R-4s, like woman’s work – is never done. Any staff officer is in that position. Sometime soon I expect I’ll be getting around to putting own on paper such account as I can give of the Saipan and Tinian operations, but don’t look for any spell-binding report. It’s mostly hard work, the excitement is occasional, and then not very exciting in the re-telling. I send you all my love. It is a wonderful feeling to have a family like mine safe at home. The 4th Marine Division had a chance to recover after Operation Forager’s success, not seeing action again until February 19, 1945. Other Marine divisions, however, were plenty busy, especially on Peleliu where the 1st Marines engaged in battle that was bloodier and more grueling than Guadalcanal. Col. Chester “Chesty” Puller’s 1st Regiment clawed up a cliff, under fire from Japanese who rolled grenades down on them from caves, gulleys and holes, costing the regiment a third of its strength. Peleliu was taken on Nov. 25, 1944. According to Richard Newcomb, author of Iwo Jima: The Dramatic Account of the Epic Battle that Turned the Tide of World War II, it was inevitable that the Allies would have to take Iwo Jima. To attack Japan, it would need the island as a fallback for B-29’s. 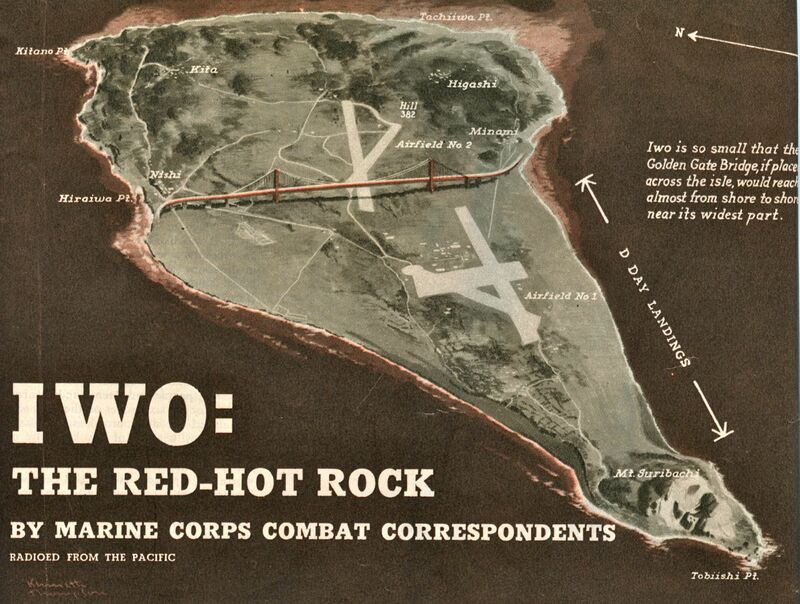 Iwo Jima was the only island in the area capable of supporting several airfields, an objective of the mission. It would be the first American attack on Japanese home territory. When Dad talked about Iwo Jima, he usually started by describing its long, narrow beach of volcanic ash (described as a sticky, glue-like substance) over which Mt. Suribachi and the cliffs loomed, riddled with Japanese defenses. Iwo was a stone fortress. Violating Japanese military doctrine, the island’s defenders developed a plan to wait until Americans had penetrated 500 yards onto the island. Then and only then would weapons open fire from the airfield, supported by artillery on Mt. Suribachi and the plateau. Sixteen miles of tunnels connected Japanese concrete artillery emplacements. After initial fire, the guns at the airfield would withdraw to the north. “When we pulled in offshore, the light was growing. You’re up on the deck. You see this ungodly ghostly tower rising 600-700’ in the air. It was a volcanic spire, the goddamnedest thing I ever saw. Scary. “The island was shaped like a pork chop. It was a volcanic mound with steep sides, honeycombed with caves. It overlooked the beaches we landed on – the Japanese had perfect visibility. Down at the far end was another escarpment looking the other way. We had one fine officer who took a posthumous award for scooping up men without leaders and taking the key point (Chambers). They got all shot up. “High velocity anti tank guns were looking right down at the beach. It was probably 500 yards or more from shoreline to airfield. It was D+2. We were in a pillbox, our first command post. The gun opened up. There was a tremendous concussion over my head, sand came down. I think a round bounced off the ground on top of the command post. “The next night, the Japanese had mortars – 240 mm – as big as a trash can. You’d see it go up. You wouldn’t know where it would come down. They dropped one about 30 yards outside the pillbox. It lit into a crater where we had 15-16 people. Just like that, they were gone. We lost some very good men, some who were friends of mine. Although American forces had overwhelming superiority, Iwo Jima was the only battle by the Marines in which the overall American casualties exceeded those of the Japanese. American losses reached 6,821 with another 19,217 wounded. Dad received his second Bronze Star with “V” for Valor for his efforts as operations officer, 23rd Regiment, 4th Marine Division. For its actions against enemy forces during the war in the Pacific, the 23rd Marines received the Presidential Unit Citation Streamer with one Bronze Star,the Navy Unit Commendation, the American Campaign Streamer with four Bronze Stars, and the World War II Victory Streamer. The 4th Marines were pulled back to base camp on Maui to reconstitute their ranks, which had been decimated by the campaign for Iwo. After receiving an ultimatum threatening Japan with “prompt and utter destruction,” American airman dropped the atomic bomb on Hiroshima on August 6 and on Nagasaki on August 9. On August 15, Emperor Hirohito announced his acceptance of the terms of the Potsdam Declaration, kicking off a national frenzy of celebration and kissing servicemen. The Instrument of Surrender was signed by the Japanese on September 2 aboard the USS Missouri. I could have titled this post, “Dad’s Other War.” Though my father shared anecdotes about some of the back room haggling that went on during discussions about potential unification of the Armed Forces, I had no inkling of the depth of those discussions. 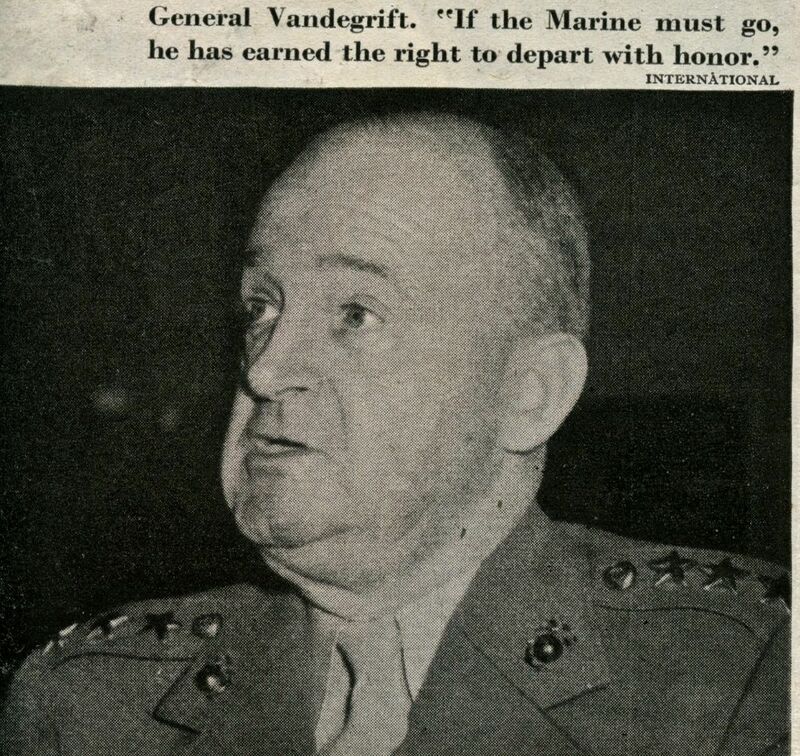 During two assignments at Marine Corps Headquarters – the first in 1946 and the second in 1959 – he was in the thick of it. Then I came across an article Dad had clipped and saved, “The Marine Corps Fights for Its Life,” by Richard Tregaskis, published in the Saturday Evening Post. Tregaskis was one of the first embedded journalists, and his book about the first 45 days on the island of Guadalcanal with the 1st Marine Division ranked on the New York Times bestseller list and was made into a movie. As sensationalistic as the lede was, it was not hyperbole. Tregaskis reported that the Joint Chiefs of Staff were meeting secretly to consider papers that were later made public when introduced at a House-committee hearing. In other words, naval police. I’d been in grad school at Ohio State in personnel administration and training. I’d been assigned to the Military Occupational Project. The joint staff at the end of WWII recognized there are people with very highly placed skills who end up being misplaced during the war. They needed more information about what jobs require people with high level skills and who the people are with those skills. “They had 300 people working on it, led by Col. Dunn. Because I’d been to advanced schooling, I was assigned as the Marine Corps’ representative. The joker is that I had Marine Corps HQ looking over my shoulder. Semper fi, Dad. You did your part. Announcement time at church. There was a reminder about the hiking club outing, a request for sign-ups to bring a salad or cake for the parish picnic on June 9, and a woman who said she had become a great-grandmother once in January and twice in April. An older man dressed neatly in a coat and tie took the microphone. “I want to remember friends who never came back,” he began. The rustling of papers and quiet conversations ceased. — I remember George Monroe who died in the invasion of Saipan. He was a lieutenant in the Marines. He had a contract to play baseball with the Boston Braves but he never returned. — And my friend Rocky Rogers. He had been captain of the swim team at Amherst. He was shot down over the Channel. 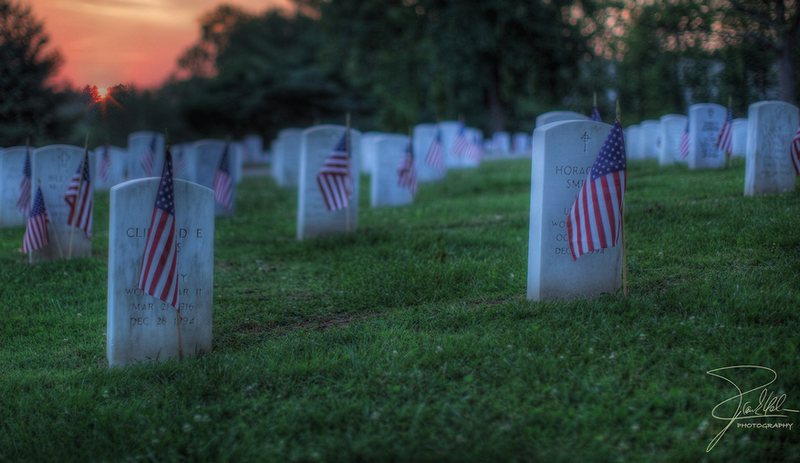 — These are the friends I want to remember on this day of days, Memorial Day. Because the George’s and Rocky’s who never came back are remembered by fine men like Herb, men with big hearts and long memories, we remember the meaning of Memorial Day. Not familiar with “ooh-rah”? It’s that explosive sound that Marines use to express enthusiastic approval. I heard it at Friday’s evening parade at Marine Barracks in Washington DC and I’ve been thinking about it ever since. Among the precision marchers on the parade ground and ceremonial hosters were a few women in uniforms identical to their male counterparts. And they looked sharp. Thank God I got out of the corps before I witnessed this political crap take place! It seems that several of the Barracks’ Facebook followers were dismayed to learn that women had invaded the Corps, and in this case, were wearing the male uniform. 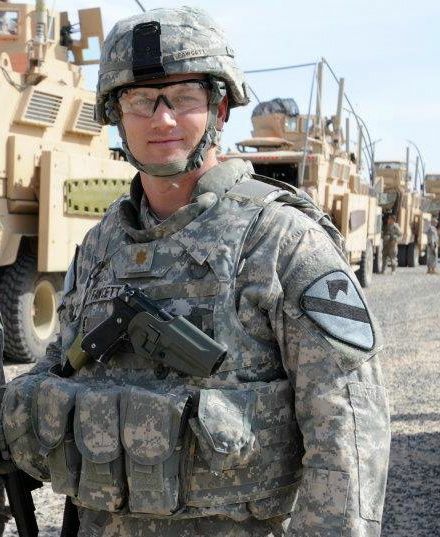 Gentlemen, it’s the prescribed parade uniform for designated personnel at the Barracks. Pls keep your personal attacks/feelings against this Marine to yourselves. I look at it like this. I dont care which uniform of the Marines she is wearing. She a Major and by the looks of it, has had a pretty good career. Semper Fi Major! I had the honor and pleasure of meeting the Marine they were writing about. And she’s not just any Marine. 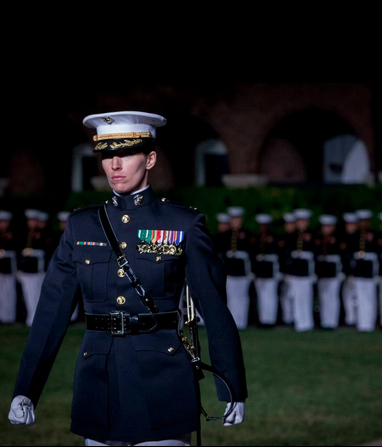 Major Sarah Armstrong is the first female parade commander of a Friday Evening Parade, a tradition that started back in my Dad’s time as Executive Officer of Marine Barracks. Those shiny medals on her jacket? They’re campaign and achievement medals. She earned ’em the hard way. At least one of those ribbons denotes her tour in Afghanistan. My mother was a strong woman. My friends are strong women. My daughter is a strong woman. In the place where my father served 56 years ago, at a time when only men achieved positions of leadership in the Marine Corps, I’m thrilled to see Major Armstrong doing her thing, and doing it so competently.